Some ideas for a ‘motivating example’ for the “Alleles changing” lecture I will be covering in Amanda Yonin’s Human Genetics course on Oct 25th. Surprising result that velvet-oases assembly with all reads results in fewer contigs of shorter length than assembly with normalized reads. Why would this be??? Parial explanation to (problem before)(/aptranscriptome/2013/10/09/more-simulation-notes.html) where only ~29 of 100 transcripts actually had gene expression counts - low read mapping to assembled transcripts. Could be because of lots of multiple alignment to the assembled transcripts vs the known transcripts. > 19.0% overall read alignment rate. > 12.5% concordant pair alignment rate. > 65.6% overall read alignment rate. > 64.8% concordant pair alignment rate. 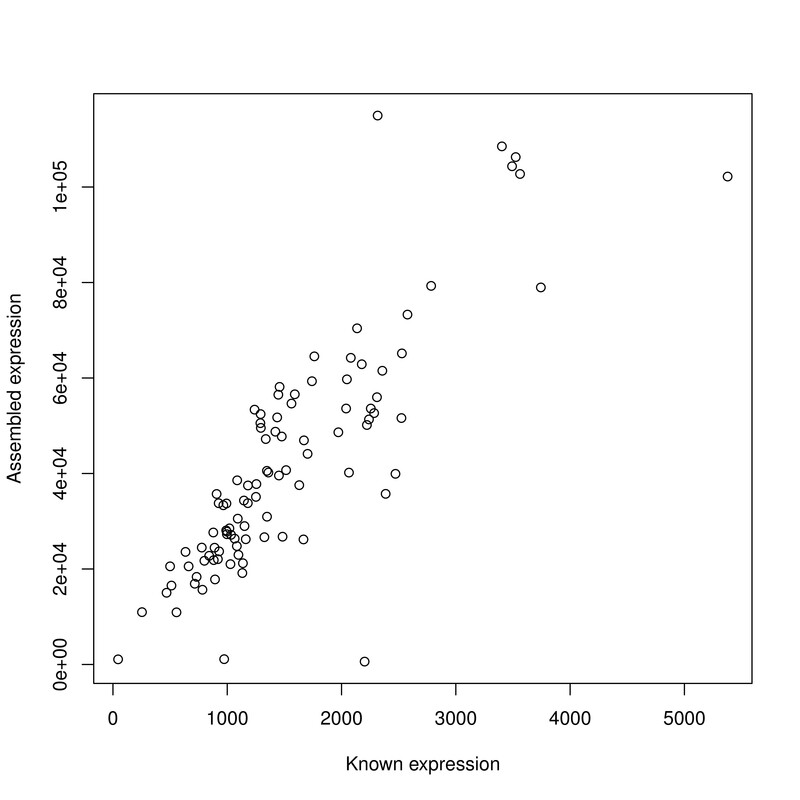 But, the correlation of expression counts from cufflinks mapped to known transcripts is beautiful! r=0.83 for 97 of 100 transcripts! Similar problem with BWA…what to do with real data where I can’t infer incorrect isoforms?